The Country Inn & Suites By Radisson Milwaukee Airport is located in Milwaukee near College Avenue and 13th Street. General Mitchell Field International Airport is 2 miles NE from the hotel. The property offers complimentary hot deluxe breakfast daily per person, a complimentary airport shuttle and 81 comfortable guest rooms blending friendly country charm with amenities and service tailored to individual needs. 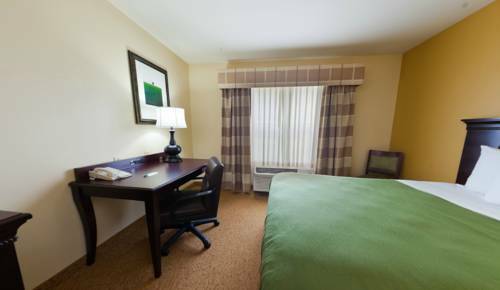 All rooms include Complimentary High Speed Internet Access, microwave, refrigerator, in room coffee maker, 32 inch flat screen LCD television. South Ridge Mall is less than 7 minutes from the hotel. Miller Park, home of the Milwaukee Brewers is 11 miles from the property. Bradley Center is 8 miles from the hotel. The hotel does not offer rollaway beds. **Long term Parking is only available with the Park and Stay Package. ** This hotel is nonsmoking. Chili's: Located 2 miles from the hotel. The Packing House: 900 East Layton Ave. 2 miles northeast from the hotel. Famous Dave's Bar-B-Que: 5077 S. 27th Street Milwaukee. 3 miles northwest of hotel. Applebee's Neighborhood Grill & Bar: 7135 South 13th Street. 1 mile south of hotel. Meeting Room: One meeting room holds 45 people. Reservations made through hotel directly. Potawatomi Bingo CasinoThis huge casino offers 3,100 slot machines as well as blackjack, roulette, craps, poker, bingo and national entertainment acts. Bradley CenterHome of the Milwaukee Bucks, Marquette Golden Eagles and AHL Admirals. Milwaukee County ZooOne of the country's finest zoos, this well-loved attraction is home to more than 2,000 animals. US Cellular ArenaMilwaukee Sports arena for several sporting events and teams. Milwaukee Public TheatreArt and exhibits.